I’m both a knitter and a crocheter and I like to combine both elements in patterns. This hat is a reflection of that. It’s only sized for itty, bitty babies right now and is probably only suitable for newborns or as a photography prop. There is a corresponding Diaper Cover. Enjoy and hey I got it up on time. That Dexter marathon this weekend was good for something. If you post use #drunkenauntwendy so I can find it. Note: this pattern requires both knitting and crochet. Finished hat measures 11.5 inches in circumference and 4.5 inches tall. Continue in Stockinette Stitch until piece measure 3.5 inches from cast on edge ending with a purl row. Fasten off. Leave long tail for sewing. Stuff horns and sew to hat. 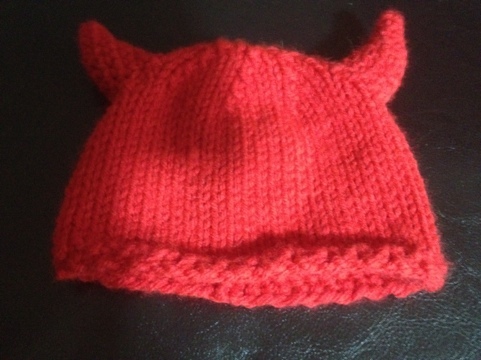 I’m new at reading patterns for crochet…so I’m having a hard time reading the pattern for the devil horns. Is there any way you could simplify it for me? I’m not sure what an increase is, or where you link or where you turn? Thanks! Thanks for visiting. An increase in crochet is two single crochet stitches in one stitch. There are no turns in this pattern and no joining stitches. It is worked in the round like amigurumi. Hope that helps. If you have more questions, please let me know. What an awesome pattern! Thank you so much for posting it, I’m going to make one for my nephew!